Over the past few seasons angling clubs and match groups have been trying to get a few more youngsters into our sport. Tydd Gote AC are one such club and for them it’s already starting to pay off. They have one or two good youngsters coming through and in 12 year-old Sonny Lynn they have a found a gem. He topped the list in the first round of the King of the Fens match fished on the North Level Drain, bagging the only net of bream on the day, all on a small feeder, putting a fine 19lb 10oz to the scales. This lad is going places in the angling world, mark my words. This was no fluke result and we’re going to see and hear a lot more of Sonny Lynn. Ray Malle was second with a good tench and a net of perch weighing 9lb 13oz, then came Pete Wills with 9lb 7oz. On the team front Sensas Mark One White take an early lead after topping the field with 27 points. Sunday saw the Peterborough & DAA lads fishing for the Henson Cup on the River Nene on the Bedford Gravels section. The length has not been fished to any great extent for several years, but looking at this match result I doubt it will be too long before another is arranged. Leading the way with 33lb of bream taken on the pole from peg 17 was Martin McHugh. He fished a maggot and caster combination netting fish to 5lb. Runner-up was Clive Turner, who opted for a feeder approach to net bream and skimmers for 26lb. Third with 11lb 14oz was Jeff Tuttlebee. Sometimes you need a bit of luck at the draw bag and on most waters end pegs are golden. 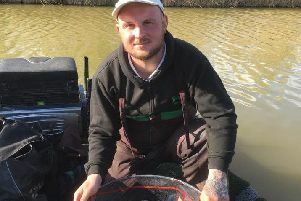 Lionel Whaley was the lucky person to draw the end downstream peg in the Yaxley, Farcet, Holme and DAC Stokes No1 Cup at Fields End Bridge and took full advantage. On what turned out to be a difficult day for most, Whaley managed to catch 4lb 7 oz of roach and skimmers at eight metres on bread punch to see off the challenge of the chasing pack. That was led by Mike Mohan at the next peg. He fished the pole with red pinkie at eight metres to catch 2lb 5oz of roach and skimmers. Third was Paul Marriott on the upstream end peg and he caught 1lb 14 oz of roach using bread punch and a waggler. Ramsey AS are one of the few clubs in the area that continue to fish natural venues but sometimes they prove a really difficult nut to crack as was the case on Sunday when they fished Exhibition Bridge for their usually productive ‘Running Line Only’ match. Match organiser Keith Rayment took the honours with a modest 3lb 10oz of small fish taken on a slider. Runner-up and the only other angler to catch was Paul Kilby with 3lb 2oz. In the Whittlesy AA club match fished on their local waters it was tough going as floating weed made bait presentation difficult. Andy Bull came out on top with 4lb 7oz of small fish and a couple of eels. Runner-up with 4lb 5oz was Mick Mohan, and then came Dave White on 3lb 8oz.